GE® Energy Star® 25.3 cu. 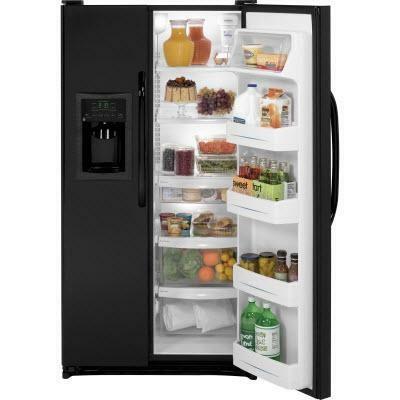 ft. Side-By-Side refrigerator with dispenser features ClimateGuard system, external temperature controls with child lock and UltraFlow64, adjustable-humidity drawer, adjustable-temperature drawer, snack drawer and adjustable gallon door bins. Total 25.252 cu. ft. / 0.72 cu. m.
Refrigerator 15.5 cu. ft. / 0.44 cu. m.
Freezer 9.75 cu. ft. / 0.28 cu. m.
Technologies FrostGuard™ technology that is a controlled defrosting to keep frozen foods from feeling the burn; NeverClean™ condenser that is a sealed compartment that keeps coils clean and simplifies maintenance; External controls with actual-temperature display and UltraFlow64 to see the exact temperature and dispense 64 ounces of filtered water per minute; ClimateGuard System that monitors temperatures and adjusts cooling to help maintain freshness. 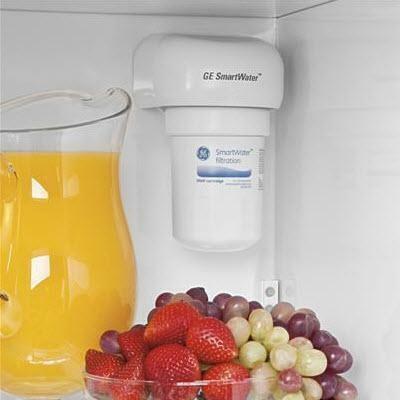 Additional Information AutoEnergy saver that senses door openings and adjusts refrigeration operation cycles accordingly; GE water filtration six month filter to remove impurities for fresh-tasting water for your family; Adjustable gallon door bins to offer ideal space for storing gallon containers in the door; Adjustable, slide-out spillproof glass shelves designed to make clean up quick and easy; Adjustable-humidity drawer with controls keep fresh produce fresh; Adjustable-temperature drawer that Helps keep your favorite food items cold and ready to eat. Warranty Limited 1-year parts and labor on entire appliance. At ABC Appliance we are a locally owned and operated business dedicated to customer service and satisfaction. We are located in Sebring, Florida and have been serving the Highlands County, Florida area since 1990. We sell and service a wide variety of home appliances to best meet your individual needs, including brands from Whirlpool, Maytag, GE,(as well as their affiliated brands) and also the ONLY local Speed Queen dealer. © 2019 ABC Appliance and TV All Right Reserved.